If you've ever made a quilt with precuts, you know just how much of a time difference it makes. The cutting doesn't always seem like much, but when much of it is done already, it's really a time saver! With that in mind, we're sharing two quilts featured in Fons & Porter's Love of Quilting January/February 2016 issue. 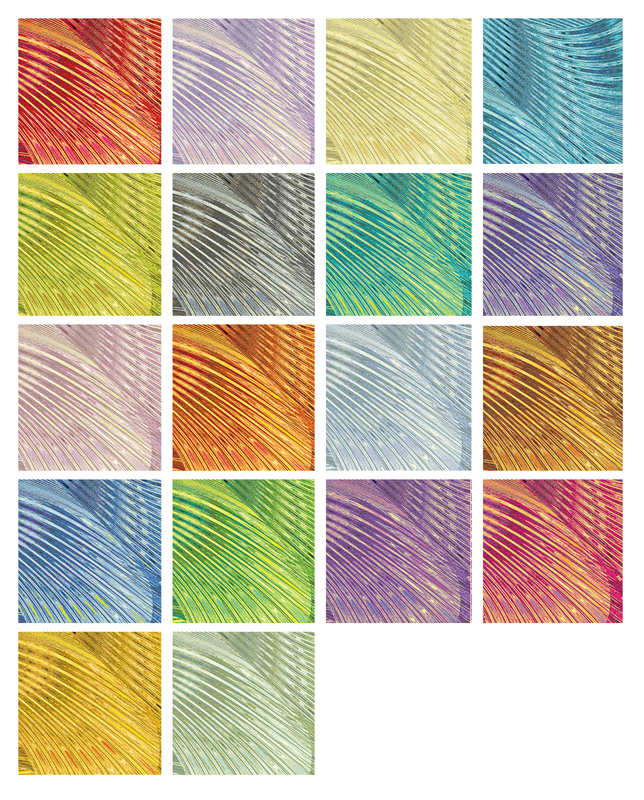 The first uses 2-1/2" precut strips from E. Vive's Fancy Free collection. The "Louisiana Breeze" quilt, designed by Colleen Tauke, just sings "spring" between the bright, fresh prints and the pinwheel design. 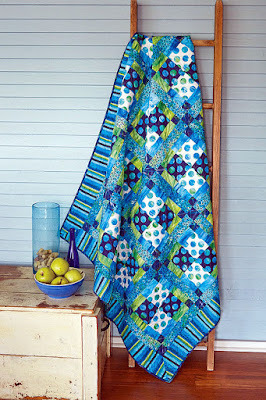 Click here to find the video tutorial for making this quilt. 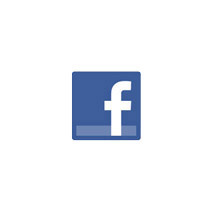 Click here to see the Fancy Free collection. Click here to find the kit for this project. The second quilt would make a sweet baby quilt. 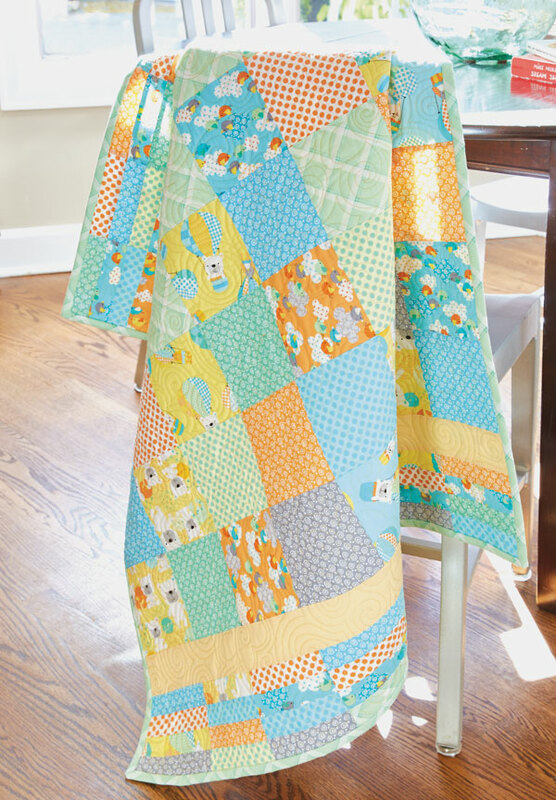 How many times do you hear stories of baby quilts being given to toddlers because they took so long to make? 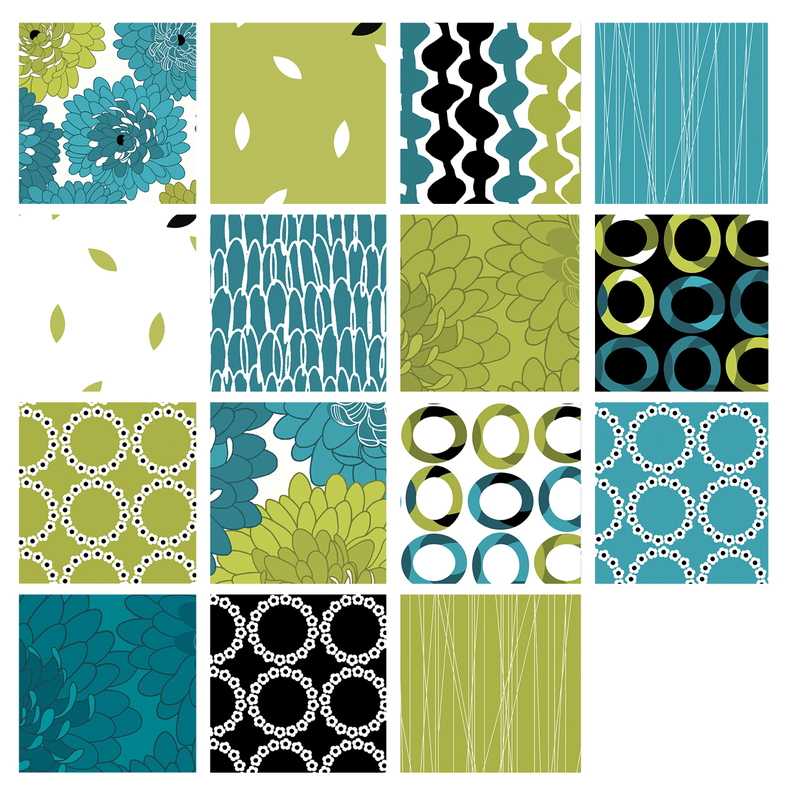 Not so with this quick design by Sue Pfau! "Charms for Baby" is perfect because it will sew up quickly using charm squares! Plus, the soft palette of Greta Lynn's Breezy Baby collection will work for boys or girls. 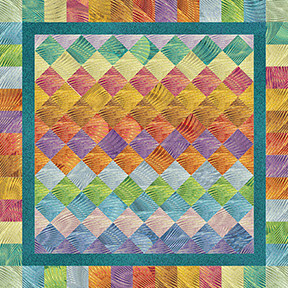 Click here to find the video tutuorial for making this quilt. Click here to see the Breezy Baby collection. 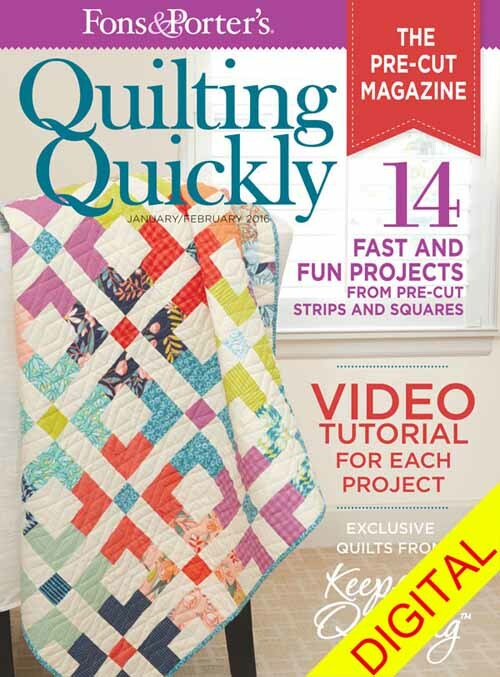 Click here to find Quilting Quickly magazine. The good news: These Oh Fudge! 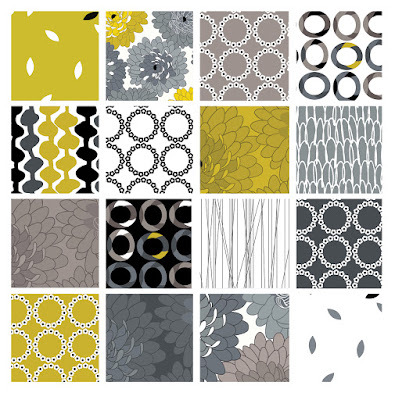 fabrics by Maria Kalinowski are calorie free. The bad news: They're so mouth-wateringly realistic that while you sew with them, you'll be yearning for some actual chocolate. 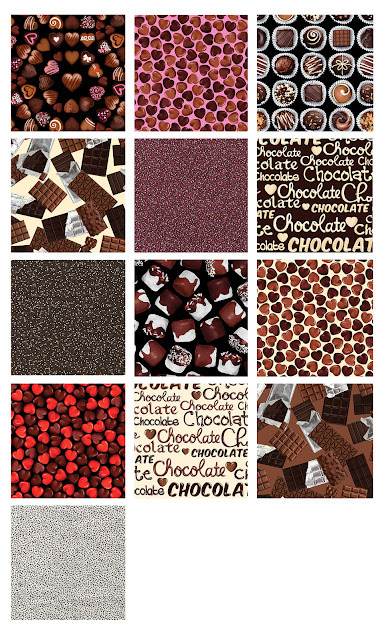 Dark chocolate, milk chocolate, fancy chocolates, chocolate text, and sprinkles...it's chocolate overload! 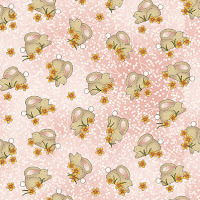 These prints would make an adorable fabric valentine, but they'd also be fun for kitchen projects all year long. Yum! Did you know that today is National Chocolate Cake Day? Is your mouth watering yet? 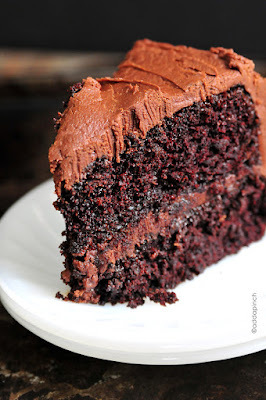 Here's the link to the recipe for the delicious-looking cake shown above. Need a couple more options? Click here for a link to the three chocolate cakes featured on Good Morning America today. Stay tuned...we'll be continuing this tasty chocolate theme tomorrow! You don't have to actually can vegetables and fruits to appreciate their appeal! 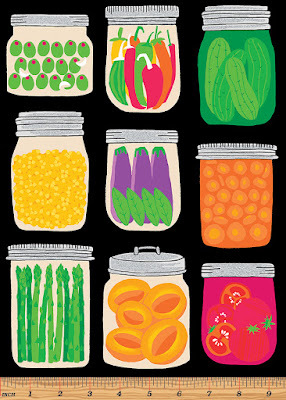 Maria Kalinowski's new What's In My Pantry collection starts with a focal print of mouth-watering jars of fruits and veggies. 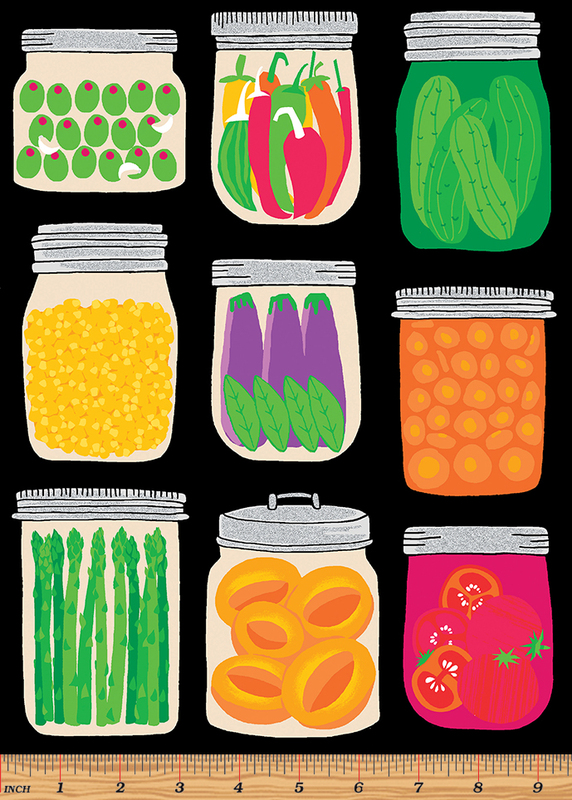 These aren't your grandma's canning jars, though--the prints are fresh and modern renderings in bright colors that pop on a black background! 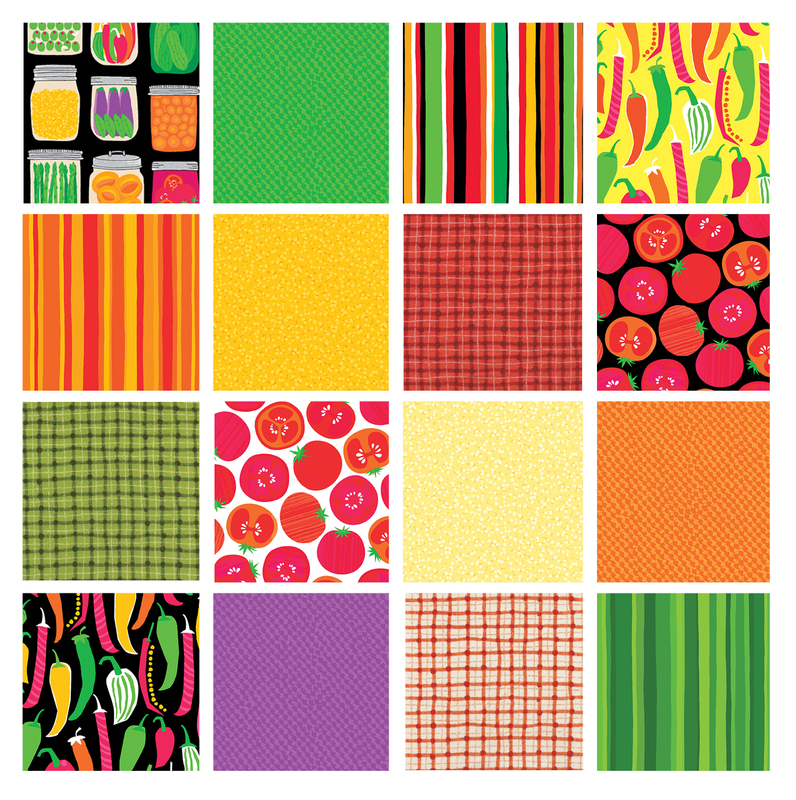 The rest of the collection is equally fun--bold colors, tasty veggies, bright stripes and homey plaids. 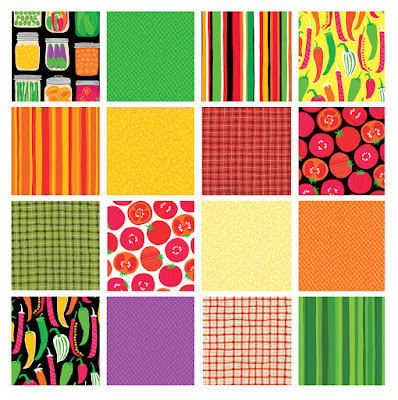 Perfect for some kitchen-inspired projects--hot pads, an apron, placemats? 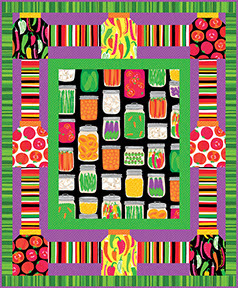 Make your own "jars" with Heidi Pridemore's "Pickling Jars" quilt pattern. 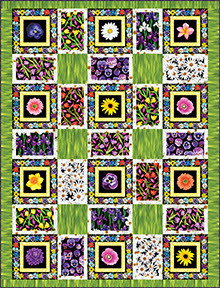 Click here to download the free pattern for this quilt. Click here to see the entire What's In My Pantry collection. 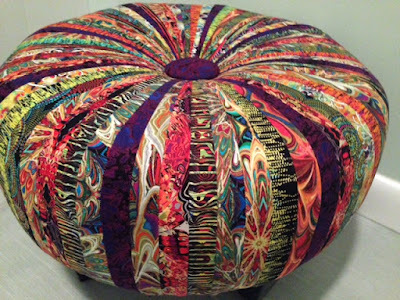 If you're a huge fan of Benartex fabrics (and you probably are if you're a regular blog reader! 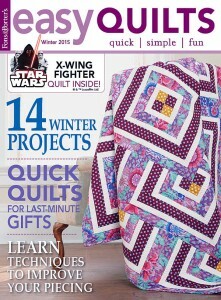 ), don't miss the Winter issue of Easy Quilts. 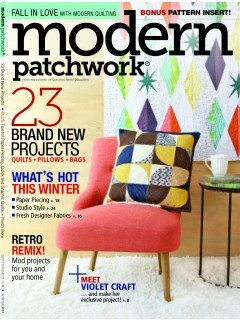 This magazine has three projects featuring our fabrics! First up is "Anybody Home?" by Melanie Greseth and Joanie Holton of Tailormade Studios. This twist on a typical house block features a checkerboard border, trees, and of course houses, all floating on a sky blue background. 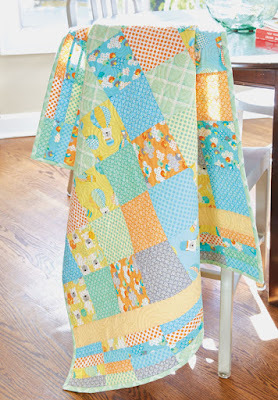 The quilt is made from Nancy Halvorsen's fun This & That collection--dots, swirls, checks--we love these whimsical coordinates! 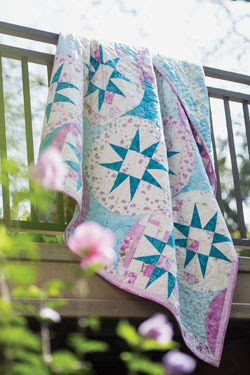 Next is the "Polka Dot Two-Step Quilt" by Tony Jacobson. This bright and cheery quilt has a summer feel year-round thanks to the fabrics it uses--Blue Paradise prints by Maria Kalinowski. 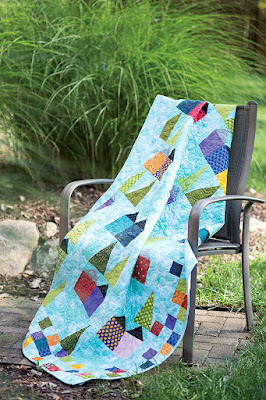 Easy disappearing nine-patch blocks framed with a bold stripe border--what could be more fun? 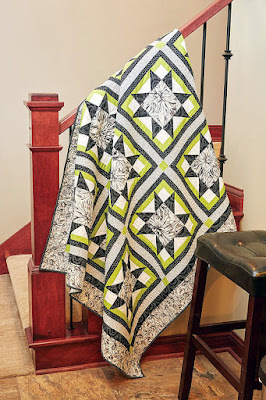 And finally, pair the contemporary black and white prints of Bellissimo with an accent color (Nancy Mahoney used lime green) in Sinclair Stars. Huge star blocks framed in a pop of color make a graphic impact. Click here to find a kit for this project. We're continuing this week's floral focus with Michele D'Amore's new collection for Contempo Studio, Fresh Blooms. Huge chrysanthemum-inspired blooms, daisy chains, loops, scribbles...this collection has such a clean, contemporary feel! What would you make with this collection? A quilt? Throw pillows? A tote bag? 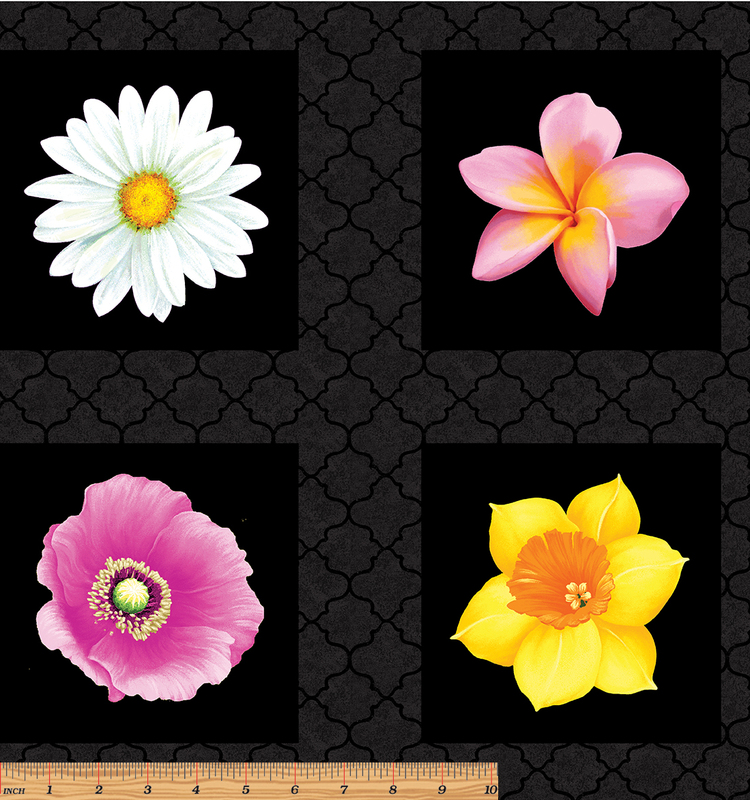 Click here to see the entire Fresh Blooms collection. These flowers are so realistic that you'll think you walked into a florist's shop! 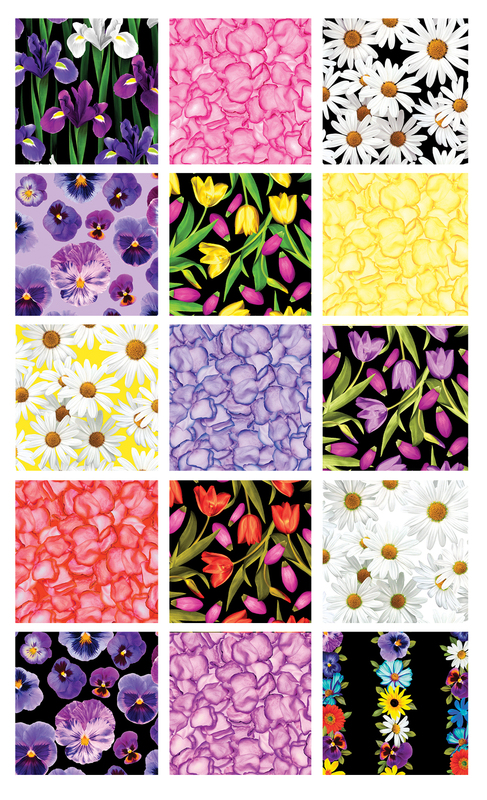 Maria Kalinowski's Bloom with a View collection showcases daisies, tulips, irises and pansies--all of spring's best! 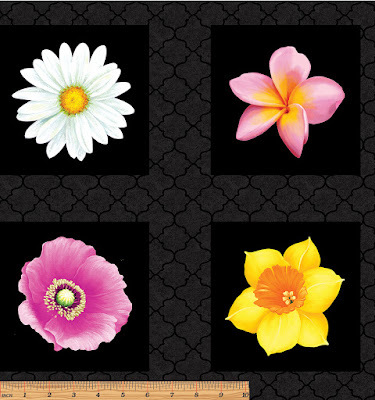 The collection starts out with flower squares ready to be fussy cut--with black or green sashing. Imagine the uses for this fun print! We love how Heidi Pridemore paired these blooms with the lime green Fleurish stripe in the free quilt pattern "Blooming Windows." Doesn't it look like grass?! Click here to see the entire Bloom with a View collection. As January stretches long, it's always nice to have a taste of spring! We hope Cheryl Haynes' Garden Days collection will brighten your day. 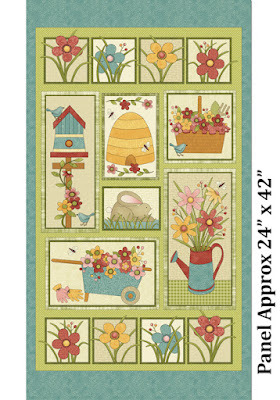 Cheryl's collection starts with this spring-filled panel: flowers, a birdhouse, baskets, bees and a bunny. Use the panel whole or fussy cut the pieces for a variety of blocks. 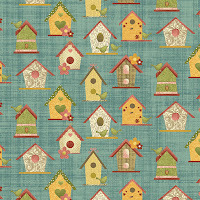 The coordinates: Plenty of tonal options, plus birdhouses, bunnies, and tiny flowers. What inspired your Garden Days collection? I had garden on my mind. 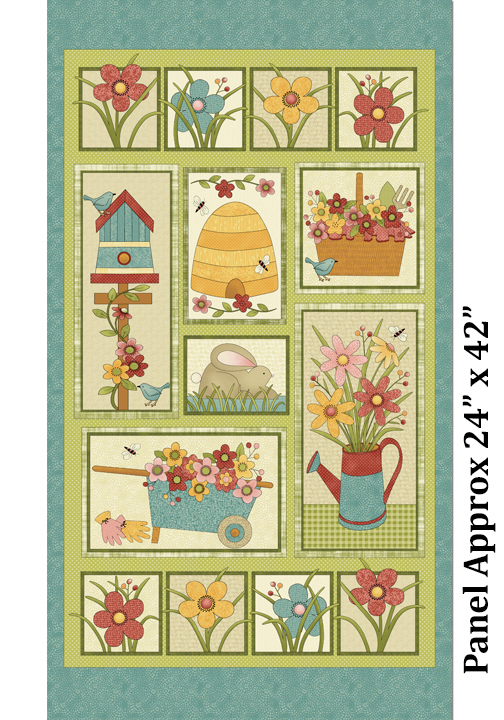 The basic idea came from my “Garden Hoppin’” pattern. 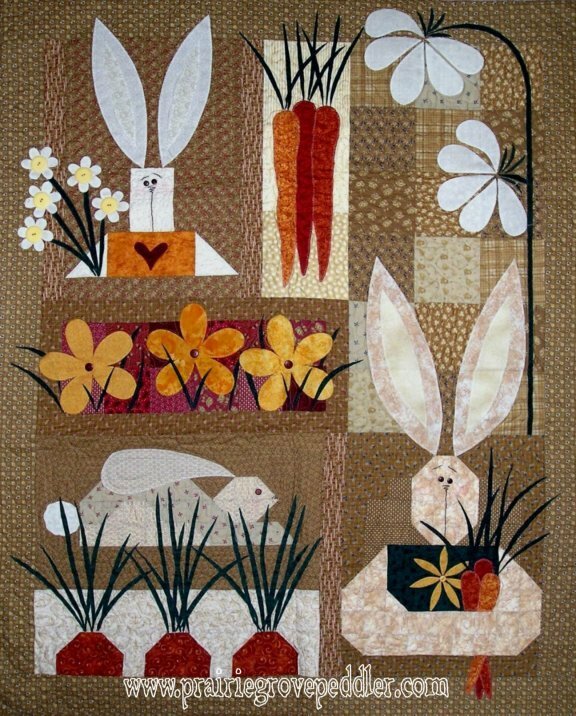 In my pattern company, years ago, I had a cabbage bunny and a carrot bunny and they were real popular. People started calling me the vegetable lady. 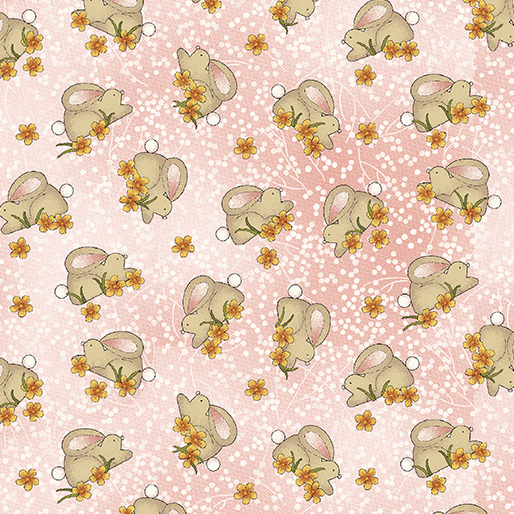 I’ve always done a lot of gardening type of things and bunny type of things. We live in the country in Missouri and we have a huge garden. My husband does most of it, but then I do the canning and cooking. What do you envision the panel being used for? Definitely cute pillows and runners, maybe a gardening apron or tote bag. Do any of the motifs in the panel have personal meaning to you? I use a lot of gardening stuff—gloves, trowel, and I keep my basket of garden goodies. I was a basket maker for years, so I have a lot of baskets. What are your favorite prints in the collection? 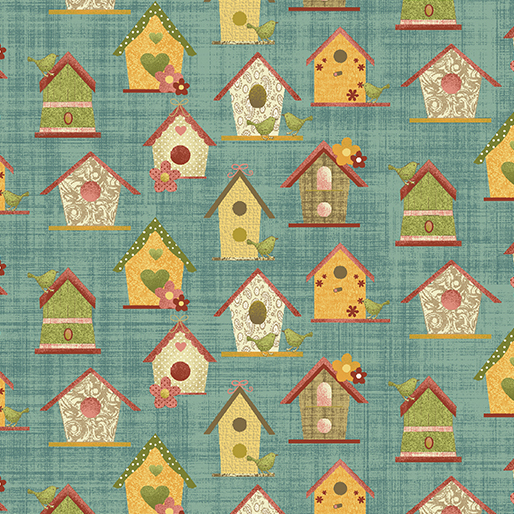 I really likes bunnies and birdhouse fabrics. My husband makes birdhouses for all our grandkids to paint. We usually have six to eight sweet little house wrens living around our house. We love having them around. 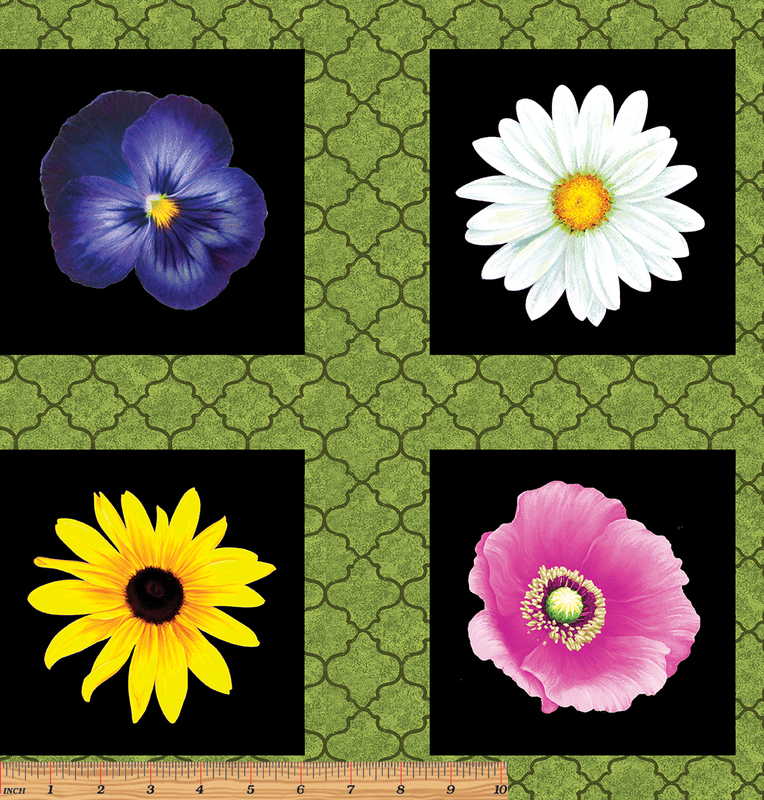 Click here to see the entire Garden Days collection. 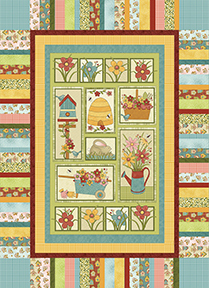 Click here to find the Garden Delights pattern. Click here to find out more about Cheryl and her work on her website. If you were inspired by the Romance Coordinates by Eleanor Burns the other day, and you're looking for a new quilting challenge for 2016, take a peek at "Pirouette." 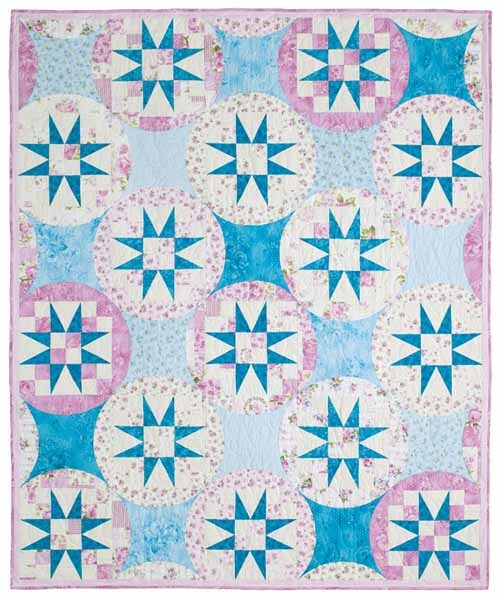 Designed by Melanie Greseth and Joanie Holton of Tailormade by Design, this lap-sized quilt features a star block and an orange peel block combination, stitched using Eleanor Burns' Christine collection. Soft pinks and aquas and delicate florals give this gorgeous design a romantically vintage feel. 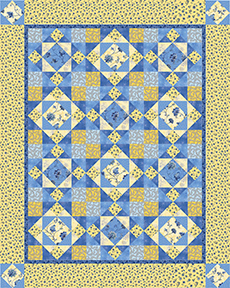 "Pirouette" is a Bonus Quilt Pattern in Fons & Porter's Love of Quilting, which means you can download it from their website. 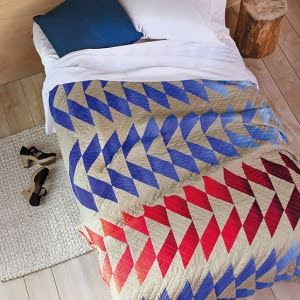 Click here to download the free quilt pattern from Fons & Porter. Click here to see the entire Christine collection, and here to see the alternate colorway in the Zoey collection. 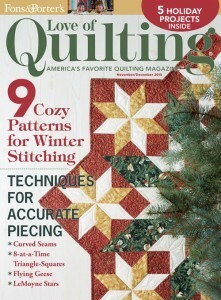 Click here to find Fons & Porter Love of Quilting magazine. 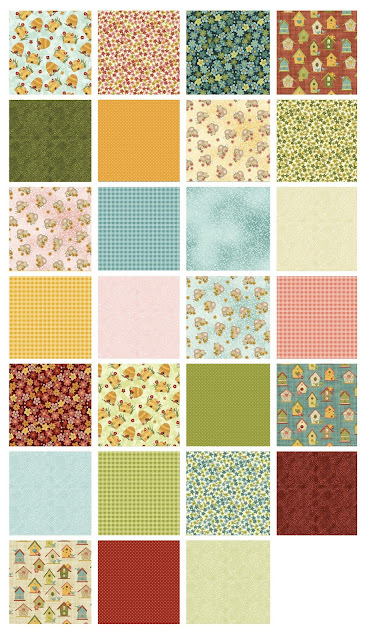 If you love to work with soft and sweet romantic fabric collections, add the Romance Coordinates by Eleanor Burns to your shopping list! 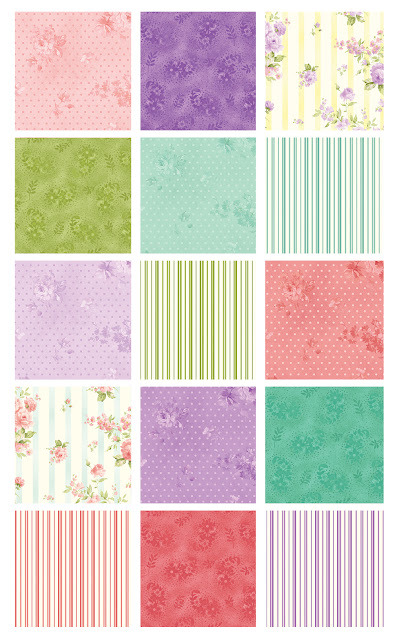 These pretty bouquets, stripes and pin dots will make a beautiful project on their own or round out the romantic florals you already have. Designed to enlarge the original Romance line, you can combine these fresh coordinates with large floral favorites for a grouping of fabrics that goes on and on. Fall in love and start sewing! Click here to see the entire Romance Coordinates collection. Click here to see the original post on the Romance collection. If you live in the northern hemisphere, January can be a gray month. The best way to combat that dreary feeling? Vibrant, happy color! The cornflower blues and sunny yellows of the Brittany collection are full of delicate blooms and patterns that have a French countryside feel--such a classic combination! 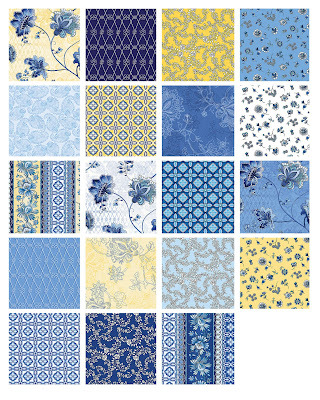 We think you'll love these prints all together, or just as a wide range of blue shades, or as coordinates to something you've already started. Click here to see the entire Brittany collection. 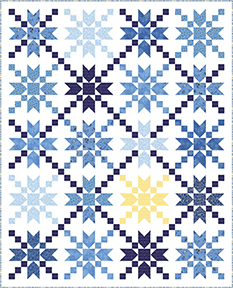 Click here to find the free quilt patterns available for download. There are tonal prints, and then there are tonal prints. The depth and texture of Caryl Bryer Fallert-Gentry's New Wave collection sets it apart! Curves, swirls, and waves in 18 different colors--delicious! 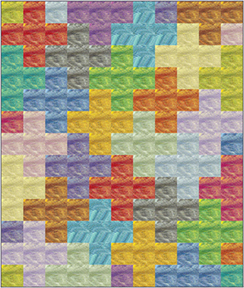 These two free quilt patterns, available on our website, show how the textured New Wave prints enhance a quilt design, taking it from "neat" to "wow"! Click here to see the entire New Wave collection. 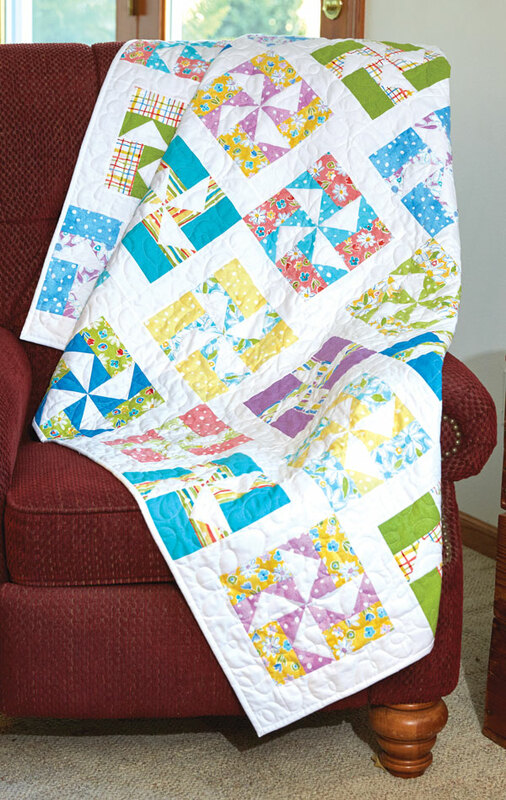 Click here to find the free quilt patterns to download. When you consider making a quilt like Shady Directions, shown below, your first thought might be to wonder how many different blues and reds you'll need. The answer? Just one of each! 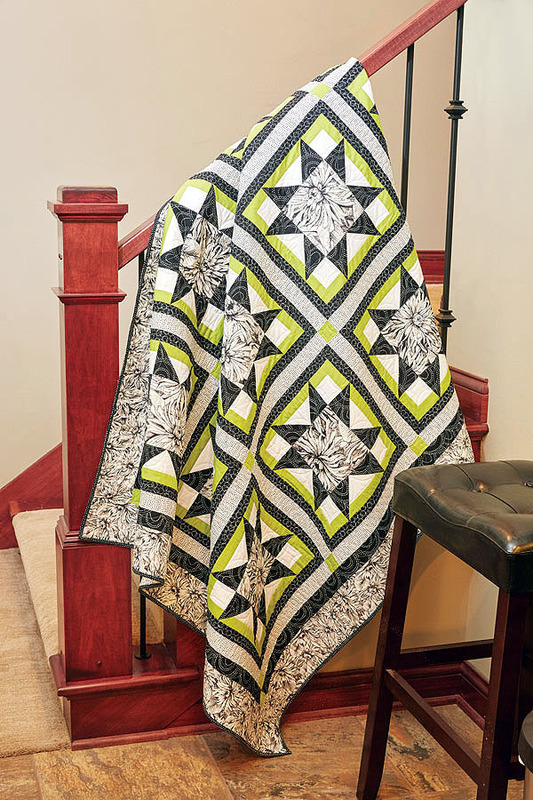 Lisa Swenson Ruble designed the Shady Directions quilt, featured in the Winter 2016 issue of Modern Patchwork magazine, using our Essential Gradations fabrics, so just one fabric goes from dark to light and back to dark again! Tell us about your quilt design. I actually had designed this quilt without a specific fabric line in mind, and briefly considered making it from my stash, using scraps from light to dark. When I came across the Essential Gradations fabric, I knew I'd found a much better solution! 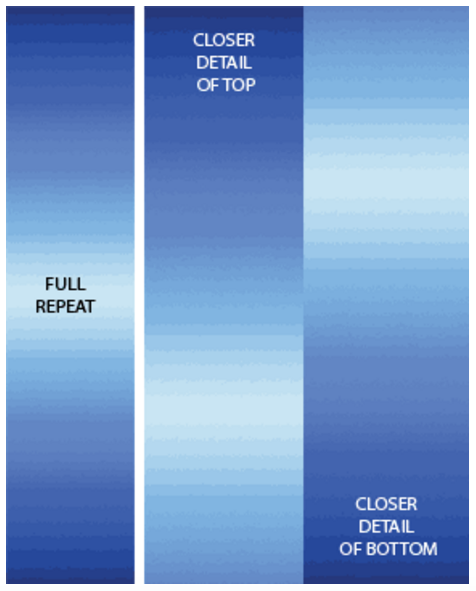 What attracted you to the Essential Gradations fabric? I love the value changes in the fabric. By carefully cutting the rectangles from dark, medium, and light sections of the fabric, I was able to create a sense of movement in the quilt. There are a bunch of different color options in the fabric line--it was hard to choose which to use! Any tips for making Shady Directions? I love the movement that the directional arrows and the changing shades create. I also really like the subtle shading in the colored rectangles--at first glance, it's easy to think that the quilt was made using solids, but the shading adds richness to the design. I wanted the quilting to enhance the angles of the patchwork design, so I chose to do diagonal lines. I don't like to mark quilts, so I marked only the first line and then used my walking foot as a guide for each additional stitch line. Click here to see the Essential Gradations collection. Click here to see more of Lisa's work. Click here to find the Winter 2016 issue of Modern Patchwork. 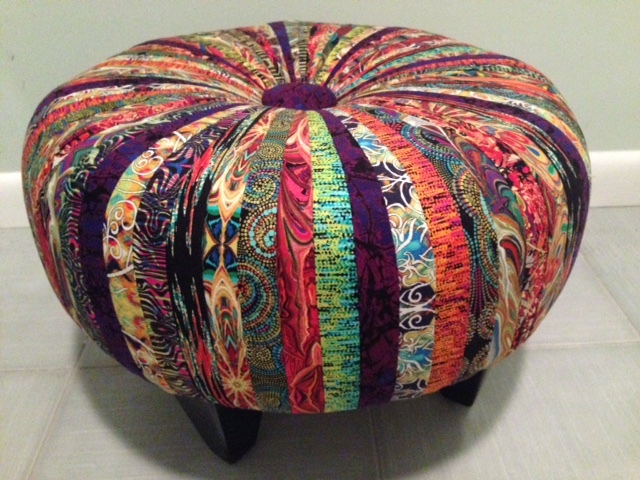 Have you seen images of pieced tuffets popping up on social media recently? If you haven't, once you see what we have to show, we're pretty sure you'll be searching out a tuffet pattern for yourself! 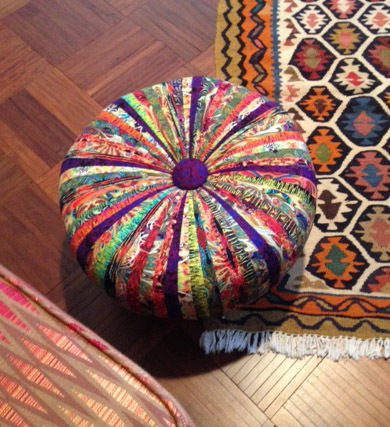 It's too pretty to rest your feet (or bottom half!) on! We definitely recognize some Fabracadabra prints in there--what else do you see? 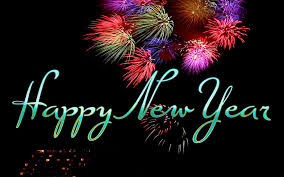 We wish you a happy and healthy 2016! 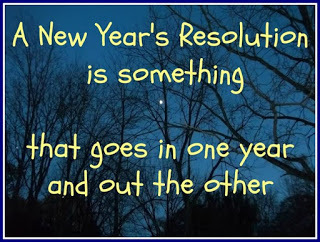 As the new year approaches, do you have any resolutions? How do you plan to make them happen? Sometimes that's the hardest part! Hoping 2016 is your best and most successful yet!